Regular payers of attention will know I like James Smythe. A lot. He's a sci-fi writer, but of the human character type rather than the epic space opera type. He is Ridley Scott and Duncan Jones rather than George Lucas. 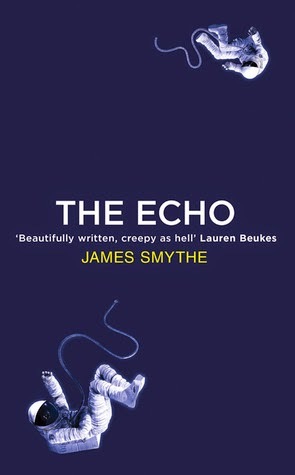 The Echo is the followup to The Explorer (my review: very good, although not the most original idea, 4 stars) and is the second of what we are now required to call The Anomaly Quartet. Set 20 years after the disappearance of the Ishiguro, two scientists, identical twins Mira and Thomas, realise their ambition of launching another vessel into the depths of space in order to study the black anomaly the Ishiguro disappeared into. Thomas remains on earth, at mission command, while Mira relates the story from the ship. This is a follow-up rather than a sequel. The Explorer stands alone completely and plotwise there's no great dis or advantage to having read it, only a degree of enrichment to Mira's accounts of what he - and the people on earth - believe happened to the Ishiguro. Yet, even that doesn't do much other than show Smythe up as somebody who appears to have thought this whole thing through, the cad, so no worries about reading that one first (although you should because it's much better). Inevitably, I'm going to compare the two books and The Echo comes off decidedly worse. Where The Explorer was tense and tightly done, The Echo feels flabby and overlong. Cormac Easton's journey had a slow inexorability about it as he watched his earlier self in the loop; Mira is vulnerable, procrastinating and fearful. And kind of dull. One of the strongest parts of the novel is the relationship between Mira and Thomas. Thomas is a voice whose responses gain ever more delay as the distance between them widens, but his is the hand with ultimate control of the ship. We are in Mira's head with his versions of things, his needs and emotions - and his views of Thomas and what he thinks Thomas will do. It is either repetitive or subtly ironic that we follow the same duel route of what-happens-on-the-ship/unpeeling-narrator's-psyche-to-reveal-their-truth of The Explorer. I found it a bit ho hum at the time, Mira's scientific detachment feeling more like self-obsession while the crew are a collection of characters who avoid absolute cliche, but still wouldn't feel out of place in half a dozen films I can think of, or even in The Explorer. I like this author and he's getting the advantage of that - I've already got The Machine on my Kindle and I'll definitely want to read the next part of this quartet. While this is very like its predecessor, but where that had its own identity, this feels an imitation of that. This is a three star read which gets an extra half because I was already interested when I began: 3.5 stars.